Productivity tips always come in handy, especially if you’re a startup entrepreneur who needs to get plenty of things done. In the early stages of your company’s growth, your daily life consists of to-do lists and various roles to play. Aside from being the leader, you’ll also be the marketer, strategist, financial analyst, HR manager, and even customer service rep.
That’s why being a productive CEO is vital. Your level of productivity can boost your company’s development. When you handle your time well, you create other opportunities to develop your startup. You’ll have extra time to guide your team, analyze the market, or develop new products and strategies. This week on Five Tips Tuesday, we’ll give practical productivity tips that will surely help you manage your startup. Find out the productivity drains that impact your workplace. Learn how to automate your business. Discover the power of boredom. Check out the tools that will allow you to work less and earn more. Lastly, get the life-changing book that will motivate you to stay productive everyday. Every entrepreneur wants to improve their workplace’s productivity. Most business owners tend to provide their employees with the latest tools, gadgets, and workshops to increase their effectiveness at work. Though a good move, it’s not enough sometimes. There are certain issues, behaviors, and distractions that should not be overlooked. Read this article to find out the seven productivity drains that affect your business. Automation is extremely beneficial for businesses. Through automation, you can remove repetitive tasks and focus on crucial ones instead. It improves the management process and lets you work smarter. Here are the top five ways to automate your business. Is your creativity running dry lately? Are you trying so hard to come up with creative solutions but your mind seemed to completely shut down? You might need to take a break and do nothing in particular. Boredom can lead to brilliance. When your body goes on autopilot, your brain gets busy forming new neural connections that connect ideas and solve problems. Watch this interesting TED Talk and find out how boredom can bring fascinating results. Technology is changing the business scene fast. By leveraging the right tools, you can work less while earning more. They play a crucial role in your success, so finding the right tool is a must. Here are the 7 productivity tools that can help your business move forward. Do you find it hard to stay motivated? 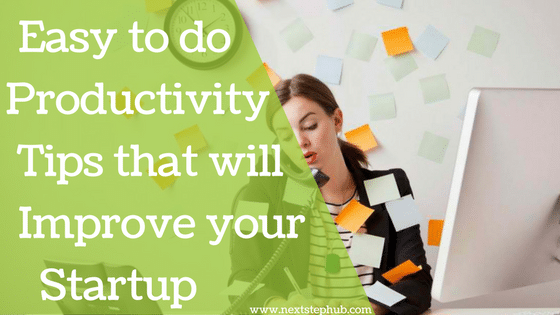 Do you want to improve your productivity but not sure how to do it? “Get More Done in Less Time” might be the answer to your problem. Equipped with actionable and easy to digest steps, this book is guaranteed to dramatically increase your productivity. Practicing the techniques and strategies mentioned in this book can bring you to a life of success and achievement. Do you have other productivity tips you would like to share? Tell us in the comments.